The Great Wall seen from the train. night. This way we will actually get to see the scenery. Ladies and gentlemen…we have had some Batrian (a.k.a. double-humped) camel sightings in the desert! haven’t seen before on the train platforms. nap and then I will continue on with Shantaram. ever seen. Nothing but sand…a whole lot of sand. I just checked out the restaurant car on the train. Talk about atmosphere – it felt like being in an actual restaurant. Border crossings are about to begin in about thirty minutes. This means that bathroom privileges are officially over as of right now. 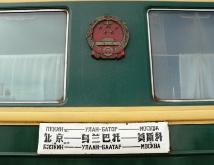 This means that it is time to dehydrate – no beverages until we start chugging along from the China border. airport. She took us one by one and made us open our bags for her. I’m bored. 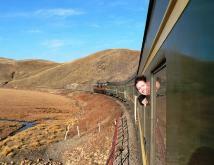 We’re still at the Mongolian border. I’m going to take a nap. not allowed off the train and all of the bathrooms are locked – this is all bad news as I have to pee. handed me his key. Who knew it would be that easy? We have entered China! We are now just waiting on the train for our passports to be stamped and all of the fun formality stuff. Seeing the buildings and the writing already makes me feel like I am a world away from Mongolia. what came of her. She could have probably had any guy in her day…and she chose Bobby. Passports just got stamped. Piece o’ cake. going to like it here! 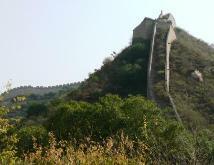 I just saw the Great Wall from afar! The landscape keeps changing. It is just beautiful out here. Big mountains in the background. Corn fields. Donkeys in the corn fields. Trees changing colors. This last leg of the train ride is definitely not disappointing. Oh my gosh. We literally just the Great Wall in all its glory. It was right next to the train. Incredible. around 2pm but will now get in around 4pm because of the delay in Mongolia.